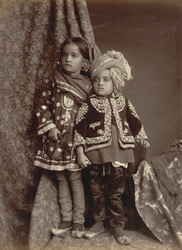 Full-length studio portrait of a young Kashmiri boy and girl, in the modern-day state of Jammu and Kashmir, taken by an unknown photographer in the 1890s. These elegantly dressed children are wearing clothing embroidered with intricate traditional patterns which are said to have been inspired by the beauty of the flora and fauna of Kashmir. This beautiful area on the northern borders of India and Pakistan is famous for its woollen textiles, fine shawls and carpets which are still produced using traditional methods going back centuries.